Remember the iconic line from the movie “Titanic”? Sorry, the movie line was actually about an iceberg. But fatbergs are real, and they can put a fat hole in a utility’s maintenance and operations budget. Fats, oils, and grease (FOG) – along with flushable and non-flushable rags and wipes – merge in our sewers to form solid, immovable blockages known as fatbergs. They are worse in the winter months when cooler temperatures make it easier for the FOG to solidify. Recently in London, it took nine weeks to dislodge a fatberg measuring 800 feet long and weighing 130 tons. That’s the same as 10 London double-decker buses. The unsightly blobs can also significantly impact water quality and the environment after sewer overflows. We traced a recent sewer overflow to grease and paper towels coming from a fast food restaurant, which had to close for five hours while we made repairs. While College Station hasn’t had fatbergs that colossal, we aren’t immune to problems caused by FOG and wipes. When a big grease blob sticks to the ultraviolet light used to disinfect our wastewater, the light can’t do its job. When that happens, Courageous operators must manually remove disgusting balls of grease, wads of wipes, paper towels – even underwear – to keep expensive equipment from being damaged. I’m not sure, but our brave operators probably draw straws to see who handles that dirty job! FOG and trash in the sewer system can also lead to increases in your wastewater rate. For the Lick Creek Wastewater Treatment Plant expansion, a $150,000 preliminary screening station was added to the design to remove such things as wipes, rags, hygiene products of the cotton and plastic variety, and trash. If you need to see it to believe it, the City of Spokane, Washington filmed an experiment with several commonly flushed items to find the answer to the question “will it flush?” Spoiler alert: only the toilet paper flushed. Manually removing the grease at our wastewater plants costs the city an average of $600 a week. Scrape food scraps into the garbage and let grease solidify in pans before placing it in the trash. Pour oil and grease into a can and after it hardens, put the sealed container in the regular trash. You can help protect your sewer system by remembering to only flush the 3 P’s – pee, poop, and toilet paper. College Station Water Services – especially our valiant wastewater operators – appreciate your assistance in reducing our fatberg problem. If you have any questions, email me at jnations@cstx.gov. Sorry, the line was actually about an iceberg. But “fatbergs” are real and can put a fat hole in a utility’s maintenance and operations budget, not to mention causing significant impacts to water quality and the environment from sewer overflows. Fats, oils, and grease (FOG) – along with flushable and non-flushable rags and wipes – merge in our sewers to form solid, immovable blockages known in our business as fatbergs. They are worse in the winter months when cooler temperatures make it easier for the FOG to solidify. Recently in London, it took nine weeks to dislodge a fatberg measuring 800 feet long and weighing 130 tons. For comparison, 130 tons is equivalent to 10 London double-decker buses. 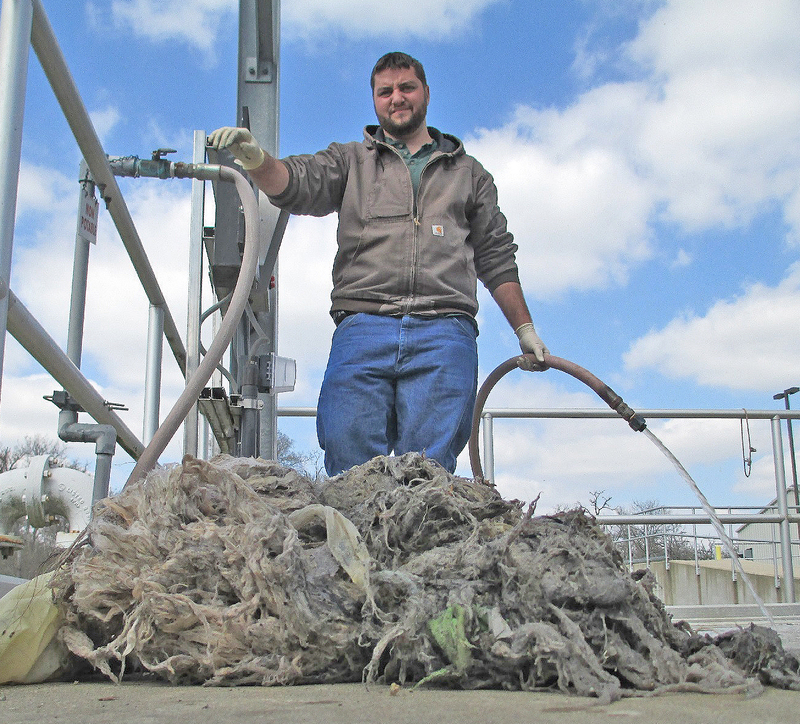 Water Production Operator Jared Lapaglia surveys a mass of non-flushables cleared from a pump. While College Station hasn’t had fatbergs that colossal, we aren’t immune to problems caused by FOG and wipes. Our wastewater treatment plants use ultraviolet light to disinfect the treated wastewater, and when a big grease blob sticks to the UV light, the light can’t do its job. Courageous operators must manually remove balls of grease, wads of wipes, paper towels – we’ve even found underwear – to keep our equipment from being damaged. FOG and trash in the sewer system can also lead to increases in your wastewater rates. For the Lick Creek Wastewater Treatment Plant expansion, a $150,000 preliminary screening station was added to the design to remove such things as wipes, rags, hygiene products of the cotton and plastic variety, and trash. Manually removing the grease at our wastewater plants costs College Station an average of $600 each week. We traced a recent sewer overflow to grease and paper towels coming from a fast food restaurant, which had to close for five hours while we made repairs. Scrape food scraps into the garbage and let grease solidify in pans first before placing it in the trash. Pour oil and grease into a can. Once it has hardened, you can put the sealed container in regular trash. Water Services – especially our valiant wastewater operators – appreciate your help in reducing our fatberg problem. If you have any questions, contact me at jnations@cstx.gov. Thoroughfare Plan: In the workshop, the council will hear an update on the Metropolitan Planning Organization’s proposed 2050 Major Thoroughfare Concept Map and the College Station Thoroughfare Plan. Capital Projects Funding: The council will have a workshop discussion about funding capital projects. Woodson Village Utility Rehabilitation: As part of the consent agenda, the council will consider an $816,000 consultant contract for design and construction phase services for the replacement of water and sewer lines near Haines Drive, Glade Street, Dexter Drive, and Timm Drive. Colin Killian (@ColinKillian) has been with the City of College Station since 2010 after 23 years as associate media relations director for the Texas A&M Athletics Department. Killian has also worked as a reporter and editor for the Corpus Christi Caller-Times and Lewisville News. A native of Hobbs, N.M., he graduated from Texas Tech with a bachelor’s degree in journalism/political science.